bluesguitarmp3: The sample is very nice. Teacher: Thanks, I'm going to teach you how to play it! Teacher: I thought I would give you two lessons, last week and this week, in the same tuning so you would have more stuff to work on with the open D tuning. Teacher: This is a familiar song called Amazing Grace and it's based off the 1 - 4 - 5 in D.
Teacher: Notice that you'll be counting only 3 beats per measure... 1 2 3, 1 2 3, etc. Teacher: With the help of the open D tuning you can play the melody within the chords while using the slide. This is a very effective way to play as you soon will learn. Teacher: Here's the opening riff to start learning. Notice that the melody is the highest note during the riff. Remember to keep your slide on top of the fret, not inbetween them. Teacher: Note: You may loop each TAB file to help you learn and memorize the riffs as we go. I'll give you a complete jam track in just a little bit. Stratman: Is this arrangement original? John: Teach what stiffness of picks do you use? Teacher: Heavy, .88 green tortex. A carpenter uses a heavy hammer to do the job, I use a heavy pick to do mine. Teacher: The melody stays on top for riff 2 exccept for the final chord where the melody lands on the 2nd string. That's ok because the 1st string acts as a harmony note. Rob: OK I've got that. Teacher: Good, you're half way through the song now! 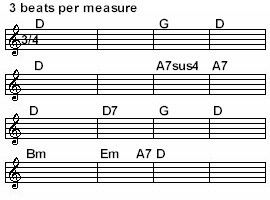 Teacher: Same thing happens in riff 3, the melody is on top, the highest note of each chord. I point this out because I find by hitting those chords with an up stroke, the melody jumps out better. Notice in the video clips you'll see me using the up stroke a lot. Rob: You aren't playing the bells with the slide are you? Teacher: Rob, the bells are harmonics played with a finger. Teacher: That's all for this lesson and I hope you are now making "amazing" sounds "gracefully". If you would like to receive your own customized private lessons using this Riff Interactive technology, you can! I teach all styles and all levels as well as how to play your favorite songs. 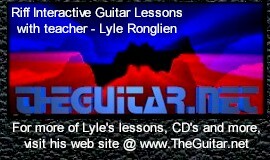 Email me at Lyle@theguitar.net for more info.